You irritated a mole, perhaps with clothing or scratching over it without realizing it, and it now hurts; does this mean cancer even though it looks normal? Common moles can get irritated in everyday life. Depending on their location, they can get irritated by being rubbed against by clothing. For example a bra strap can irritate the same mole on a daily basis. The result can be an obvious hurting or soreness coming from the mole. Some people are worried that the degree of this is either predictive of future cancer or melanoma, or that it means that the cancer is already present (though not visible to the naked eye). Can a perfectly normal mole still hurt if it gets irritated? “Even a normal mole can hurt if it is irritated,” says Dr. Janet Prystowsky, MD, who’s a board certified dermatologist in New York, NY, with 30+ years’ experience. “Any skin that is irritated can hurt. However, a mole that appears more irritated than your other moles might be a sign of concern,” especially if there’s no recent history of that mole getting rubbed against by clothing or being scratched over. In combination with her focus on early skin cancer detection and removal, Dr. Prystowsky provides a wide range of revitalizing and rejuvenating treatments. Does a Painful Mole Mean Melanoma and Should a Doctor See It? 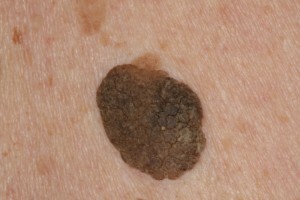 What Are New Colorless Moles on Your Face: Fast Growing Cancer?